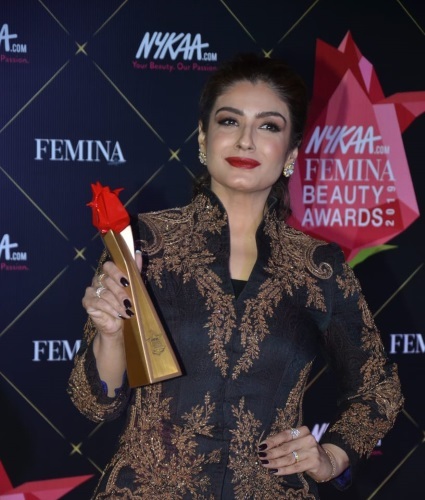 Wearing a Raghavendra Rathore embroidered jacket and tiered skirt, Raveena attended the Femina Beauty Awards on Wednesday evening. I may not be a fan of that skirt but it sure was nice to see a designer who we don’t see much of on these pages. she looks like a Black forest cake and the award is the cherry on top! That jacket is giving me anxiety with the misaligned embroidery…it looks like when u button your shirt wrong/skip a button !! Young nanny McPhee with makeup ! Vamp!!!! As they appear in our TV serials.. Please find us a decent Raghavendra Rathore outfit — and most of them are — to make us forget this horror! She looks like she has stepped out of a fairy tale where she Snow Whites stepmother! The up down front buttons are an embarrassment. If this is fashion to RR , I want to puke. Oh Lord! what a disaster!! Sighhh! Paindu as always…. Reminds me of Susan Sarandon’s character in Enchanted.